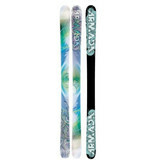 Armada Cantika inc P11 Binding The Cantika is the ultimate lightweight all-mountain ski. Its tip width and side-cut allow for easy turn initiation and a tight turning radius for enhanced control. Its design will take you from groomers, to park, to frontside terrain.